Lock in a great price for Laguna – rated 8 by recent guests! It was clean, the stuff was helpful, there was a kettle and a couple of mugs, fridge and a hair dryer. 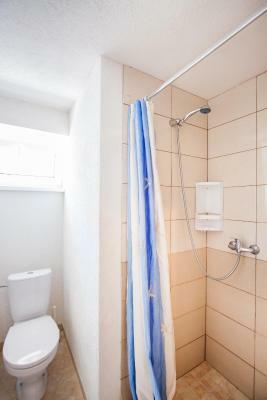 Good quiet location, not far from the center, clean equiped for any period stay. The hosts were super friendly, and the rooms were nice and clean. It's a bit out of the centre, but the town is small, so it's not a problem, plus you can rent bikes or just have a calm stroll along the lagoon. Owner speaks excellent english and was very informative. Dishes for 3 in room. Very clean and tidy on arrival. Good water pressure and adequate hot water available. Free Wifi worked. Coffee is provided. bed comfortable & there was a hairdryer!!! Also it was cheap! Quite far from the center, you actually need bicycle, but they rent it. They have also here close a small mini bus that can take u to the center. The room was quite small for 2 people but ok.
Accomodation was very nice and clean, owner was very kind. We can recommend to everybody. The staff was helpful and sweet. We have arrived almost at 10 PM and were greeted friendly. Room was very clean and had everything you'd need for a weekend stay. 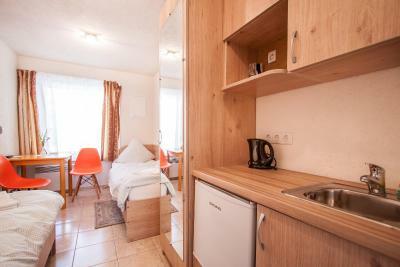 The property also rents bicycles which is very convenient as the location is little bit out of the city center, however it's way more calmer. Everything was just perfect! Very tidy and neat apartment. The surroundings were quiet and relaxing. I definitely recommend it! 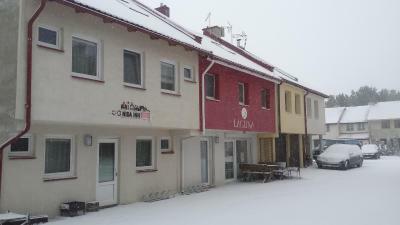 Located at the edge of a forest and only 650 feet from the banks of the Curonian Lagoon, the Laguna motel offers good-value rooms, a 25-minute walk from Nida's center. All Laguna rooms have new, solid wooden furniture, a private bathroom and parquet flooring. Bicycle rental and airport shuttle services are available. When would you like to stay at Laguna? A room with a private entrance and a TV. 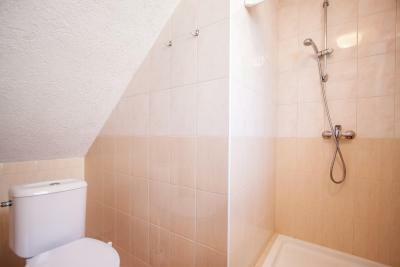 There is a bathroom with a shower and a hairdryer. 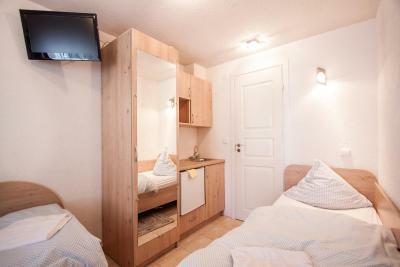 This junior suite has a comfortable seating area and an extra large double bed. This bungalow has a stovetop, dining area and tile/marble floor. House Rules Laguna takes special requests – add in the next step! Laguna accepts these cards and reserves the right to temporarily hold an amount prior to arrival. Please note that late check-in after 22:00 is available upon prior request at surcharge of EUR 10. Please note that guests are not allowed to bring bicycles inside the apartment. Please note that a free public car park is located 350 feet away from the accommodations for your convenience. 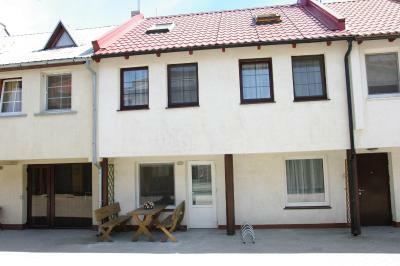 The accomodation was located in a residential area a bit off Nida-centre. Not sure if I would have liked without a car at hand. We stayed in the superior room / "junior suite". It was indeed spacious as described. The, though, was literally the worst I've ever experienced. It creaked every single time you slightly moved at night, not to mention dared turning around. It consisted of a matress placed on osb-plates in a wooden frame. Really not a nice night's sleep. The Spit itself is a nice place to be. Also, the owner seemed friendly. 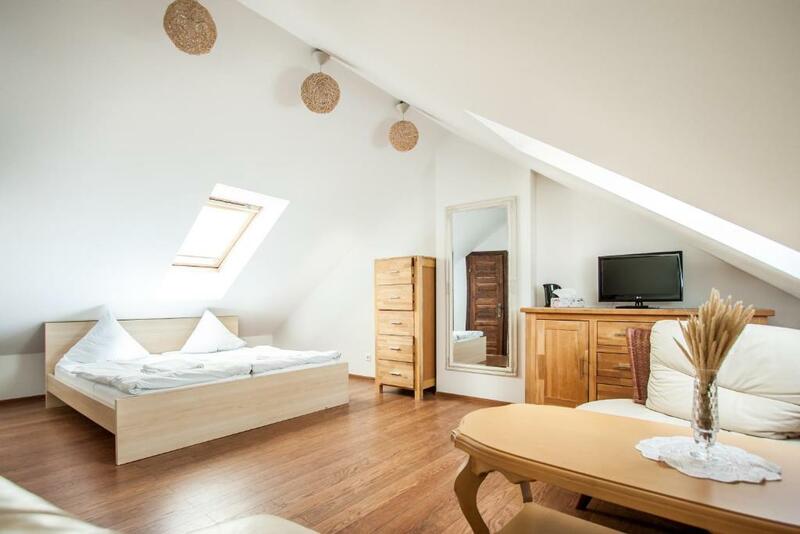 The quality/price ratio was not that good, the hotel is located in a small path surrounded by little buildings, therefore it was quite noisy because of the strong echo. Lack of plugs in the room, we couldn’t charge our phones and have the small bed lights on at the same time. The bathrooms needed a good renovation. There was also not enough towels. The price we paid was too high compared to the room&bathroom we got. The staff was very friendly, the bed was comfy. It was ok. Nothing bad. We asked for fan in room, but didnt get it. 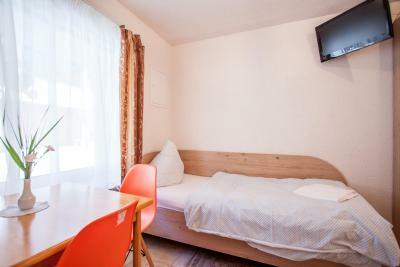 Nice and tidy room, friendly staff. Cons: close to none sound isolation, the buildings are garages with the second floor built on top, no breakfast included and no kitchen corner in the room. No ventilation at all, very high humidity, towels and clothes stay wet. Lacks chairs. The sink in the bathroom was cracked, the floors were not swept properly, there were electric cables hanging out of walls. There was not enough light in the kitchen. All the window blinds were broken and dirty. There were were cracks in the floor and I’ve seen small insects running into them. There were at least two spiders in the appartment. The stairs were very steep and the bannisters were extremely unstable. Our child had leand against one of the bannisters and almost fell down the stairs. The bannister actually gave way of about 5cm before we cought the kid. The view was nonexistent and the sea was 200m away but through a building area and the next beach was about 2.5 km away. It was decent price and the person who greeted us was great. He gave us good recommendations and was friendly. The service, and big rooms . It was a bit far from everything, we did not rent bikes but I would recomend you to do it! Parking NOT available near the hotell, we had to park on a street some 100m away..
Nice and clean! Small but we had a good night sleep! Helpful staff , gave us do’s and dont’s for our visit. Not close to the city center but if you like to walk you can walk by the sea in to town. Lighting in the bathroom was not enough. Room is very big and comfortable with a sofa and chair. Small fridge in the room as well as few dishes. Very friendly staff. 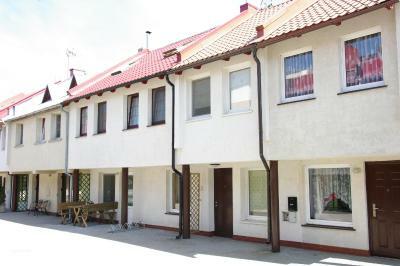 Location 15 minutes walking distance from Nida centre using nice promenade path. Very romantic. It was hard to get to the place because of the roadworks. Should place signs indicating optional road. A bit far from centre so bicycle renting would be nice.